As summer nears and the temperatures rise, most of us seek ways to cool off. Have you thought about how your dog also needs relief from the summer heat? Dog pools are a great option to keep your pooch cool in the summertime. Keeping your dog cool in the summer is crucial to its health and will prevent it from overheating which can be a life-threatening issue for dogs. Pools for dogs also work great for when you need to give your dog a bath, and they also help your dog get more exercise. There are many budget-friendly, high quality options out there when it comes to dog pools. Why not just buy a kiddie pool for your dog to use? Kiddie pools are not built for use by dogs and therefore are not durable enough to handle the rough play from a dog. Pools made specifically for dogs are much more durable. 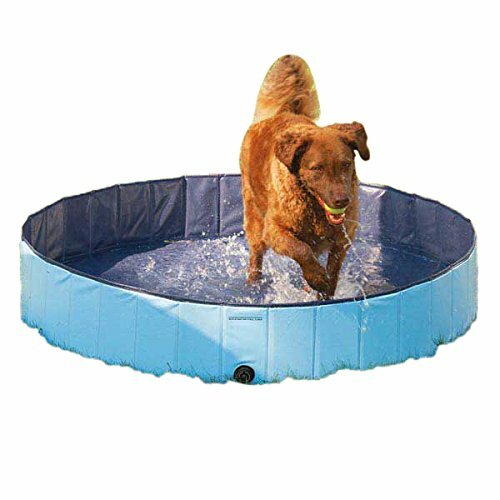 Constructed from extra-tough PVC material, this durable pool can withstand the rough play of your dog. You dog will be free to jump around all it wants without tearing up the pool. This pool is big enough for your small dog to splash around it and get completely wet, and it is only 8 inches deep, so you don’t have to worry about the danger of your dog drowning. This pool is easily portable- when it’s dry, just fold it up and go. When folded up it measures just 7.5 inches x 9.5 inches, making it easy to take anywhere with you. The panel segments make it easy to fold up compactly. Make sure to only fold up the pool once the water is drained and it is completely dry. No matter where you go, you will be able to bring some fun along for your dog. The Cool Pup Splash About pool will make the perfect addition to your backyard, patio, or deck. Made of extra-tough PVC, your dog can play around all it wants in the pool without making tears or rips in the material. This pool is great for your dog to use to cool off in the hot summer months. Measuring 31.5 inches x 8 inches, it is the perfect size for your small dog. 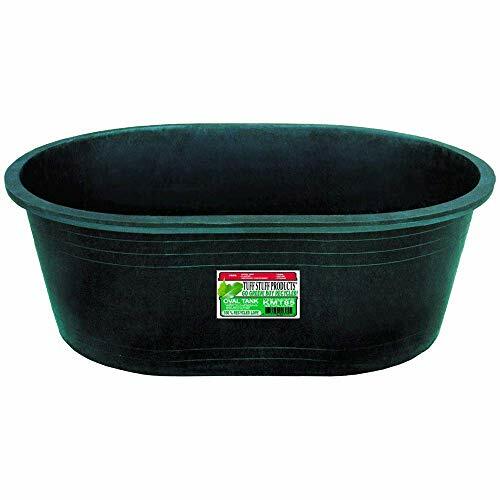 It can hold up 19 ¾ gallons of water-enough for your dog to get completely wet and is shallow enough so that it does not go under water. But be advised that you should never leave your pet near the pool unattended, as a safety precaution. Always supervise your pet while it is playing in the pool and do not allow it to chew or stand on the pool edge. The section panels in the pool make it easy to fold up and take wherever you want go. When cold weather moves in you can easily pack the pool away and it won’t take up too much space in your garage. It’s easy to set up and to take down. Drain the pool completely before folding it up for travel or for storage. The Cool Pup Splash About dog swimming pool is also veterinarian approved by Dr. Katy, ensuring that you get the best pool for your dog. This Fuloon pool is versatile and can be used also as a bathtub so you can easily give your dog a bath. It can also be used as an outdoor water pond or fish pond. Made of quality PVC material, it is strong and resistant to rips and tears from your dog’s claws. Since it is not inflatable, it can withstand rough play from your dog without suffering any damage. All of the edges are well sealed to prevent leaks. It has a red exterior and blue interior for an attractive appearance. This Fuloon pool measures 23.6 inches x 7.9 inches and is the perfect size for a small dog. Set up is easy, just unfold it and fill with water. When you want to take it down, simply open the drain plug and the water will quickly drain from the pool. Once it is completely drained and dry, simply fold it up to either store away for the cooler months or to take with you when you travel. It folds up very compactly so it is easily portable. Since the water inside the pool drains out quickly when the drain plug is released, cleaning the pool is also quick and easy. The Pawhut Foldable pool is made of strong PVC to ensure it will hold up against the claws of your pup. It does not require any inflation, so you can set it up in seconds. Setup is easy, just open it and fill with water. A built-in plug makes draining the water easy when you want to take it along with you somewhere or store it away for the winter. Once you drain out all the water, simply fold it up and you are ready to go. Measuring 31.5 inches x 8 inches, the Luxehome Pet Swimming Pool is the perfect option for your small dog. It is made of extra-tough PVC to guarantee long-lasting use, and it will not leak. You can just sit back and relax while your dog enjoys the pool, knowing that it will not tear or leak as it jumps in and out of the water. You can take it with you when you are on the go- just empty the pool, wait until it is dry, fold it up, and pack it. It is very lightweight so it won’t weigh down your bag. To set it up, just make sure that drain plug is closed, put a running garden hose inside the pool, and fill to the desired depth. 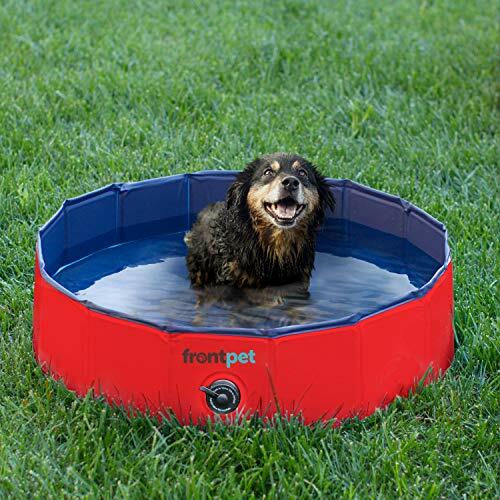 This large Frontpet Pet Pool measures 50 x 12 inches and is the perfect pool for your large dog to cool off in while sitting, standing, or lying down. Constructed of extra-strong PVC, you don’t have to worry about your pet ripping it with its claws. It simple to use-just open it up to fill with water, close the drain plug, and add the desired amount of water. When you want to change the water or take it down to take with you, simply release the drain plug and empty out the water. Once it is dry, fold it up and it is ready to be stored away for cooler months or to take with you somewhere. 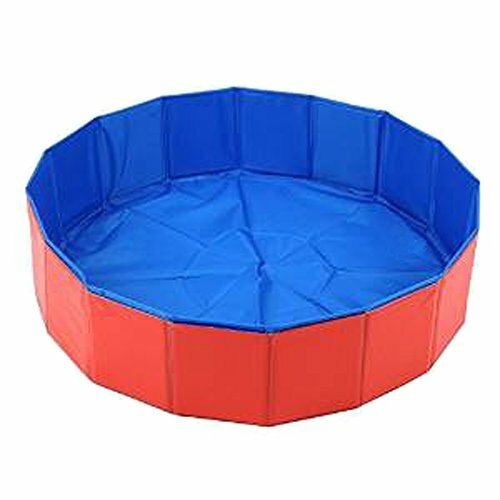 Even though this is a large pool, it folds up into a 12 x 13 in. square for easy portability. The fun design of the Bone Pool makes it a great addition to your back porch or yard. Constructed of truckbed liner material, it is very strong, durable, as well as chew and UV resistant. This means your dog can play all it wants in the pool without causing any damage. The truck bed liner construction also helps the pool to stay cool despite being beaten by the hot sun. There is a brass cap and drain to easily drain the pool so that you can store it away. It measures 11 inches x 44 inches x 66 inches so it is plenty big enough for a large dog. It holds up to 85 gallons of water when filled to the top. Even though this is a heavy-duty pool, it weighs just 23 pounds when empty, making it easy to move around your yard. The Cool Pup Splash About Pool is the perfect option to provide your dog with a refreshing oasis to cool off in. You can place it in your backyard, porch, deck, or patio to keep your dog happy all summer long. Made of extra-tough PVC material, your dog can splash around in the pool all it wants and you don’t have to worry about the pool being ruined. 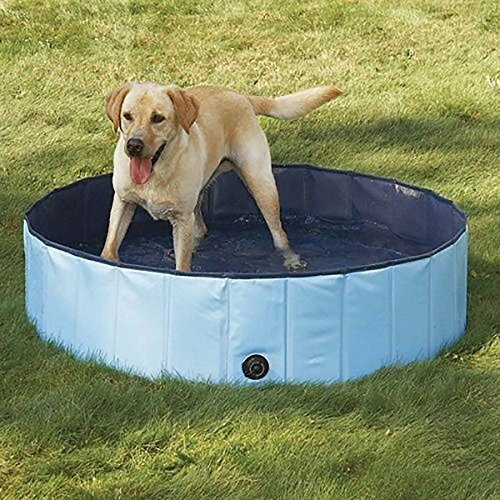 This pool conveniently folds down so that you can easily store it away for winter, or take it along with you on outings or vacations so that your dog will always stay cool no matter where you are. Available in 3 sizes, the large size measures 63 inches x 12 inches and holds 119 ¼ gallons of water. This ensures that your large dog will get completely saturated with water whether lying down or sitting in the pool. 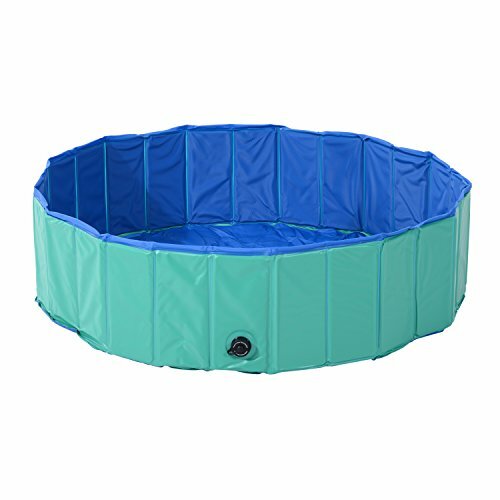 Coming in at number four is the Fuloon PVC Pet Pool. Constructed of strong waterproof PVC material and equipped with well sealed corners, it is sure not to leak no matter how much your pup splashes around. Besides functioning as a pool where your dog can cool off, it also functions as a dog bathtub so that you can easily wash your dog when it is bath time. There will be plenty of room for you to stand in the pool with your dog while bathing it. Available in both large and extra large sizes, this is the perfect option if you have a very big dog. The large size is 47.3 inches by 11.8 inches and the extra large size measures 63 inches by 11.9 inches. Your large dog will be able to get fully soaked when in the pool whether it is sitting, standing, or lying down. It can also be used as a bathtub so that you can easily wash your dog. Made of eco-friendly PVC materials, this pool is strong but also safe for the environment. The durable bottom material ensures that it will last for many years and eliminates the need to put a tarp beneath the pool when on hard surfaces. Your pup will love to cool off in this fun, bone-shaped pool which will make a great addition to your backyard decor in the summertime. Constructed of the same material that is used for truckbed liners, this pool will last a lifetime. It is UV resistant so it won’t get damaged by the sun, and it is also chew resistant. Your dog can play around all it wants in the pool without causing any damage to it. With a capacity of 85 gallons, the Bone Pool is a great choice for large dogs. The quality brass drain plug allows you to easily drain the water from the pool when you need to change the water or store it away for the winter. The Bone Pool is nothing like the cheaply made plastic kiddie pools that easily crack and succumb to the hot sun. It is a high-quality pool that is built to last. This version of the Bone Pool has the same features as the one above but is a little bit cheaper. Measuring 11” x 44” x 66” and able to hold 85 gallons of water, this is the perfect choice to keep a large dog cool in the hot summer months. The fun design also makes it a great addition to your yard, and some people have even built a little deck around it to make it the ultimate canine retreat. The heavy-duty truckbed liner material is UV resistant and stays cool under the hot sun, keeping your dog cool and comfortable. The brass drain plug is durable and you can release it to quickly drain water out of the pool when you want to change the water or put it away in storage. No need to tip it over to empty it, which can be difficult. ​Dogs love to chew on things and since this Bone Pool is chew resistant, you don’t have to worry about your dog causing any damage to it. The Bone Pool will be your dog’s new best friend and it will enjoy it for many years to come. Featuring a paw-shaped design, both you and your dog will love this uniquely designed pool. It measures 6 inches x 38 inches x 39 inches, making it the perfect size for a smaller dog. Since it is just 6 inches high, a small dog should not have a problem getting in and out of if. It holds 20 gallons of water, ensuring that your small dog can get fully saturated with water when in the pool. Constructed of durable truckbed liner material, it is build to last for years to come. It can withstand scratches from your dog’s nails and can endure your dog’s endless jumps in and out of it. The strong material of this pool cannot be chewed through easily. 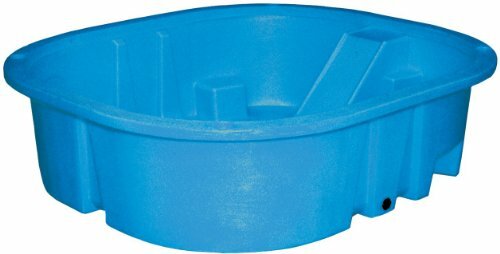 Unlike many other pools, this one does not have a drain plug but it’s paw shape allows it to bend as you pour water out, making it easier to drain. In effect, it flexes just like a real paw. Since it is a smaller pool, tipping it over to pour out the water is not very difficult. Even when the sun is beating down, the pool stays cool, keeping your pup comfortable. The material is made of UV resistant properties, so there’s no need to worry about it being warped by the sun. This pool isn’t made specifically for dogs, it’s made for people, but is a great option for a dog swimming pool. It is very large, measuring 80 inches x 90 inches x 24 inches and holds a whopping 500 gallons of water. This pool works great if you want your dog to have room to swim around and play. It has a one piece construction to prevent cracks that can occur at seams. The strong polymer plastic will not rust or corrode. Your dog will be able to safely jump in and out of the pull over the durable rim which has no sharp edges. The UV resistant properties aid in the longevity of the pool. If your kids want to use the pool too, they will enjoy using the two built-in seats, slide, and four built-in cupholders. Coming in at number 5 is the Tuff Stuff KMT85 Oval Tub. 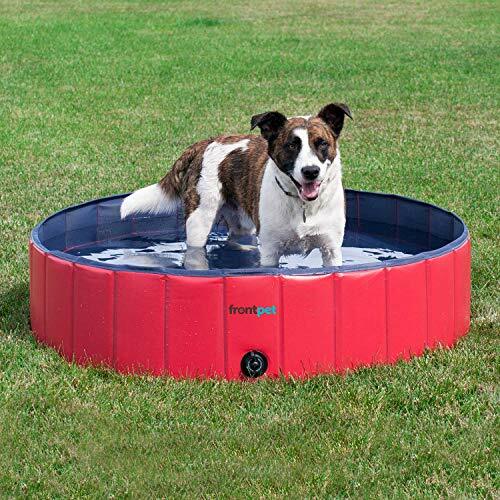 It is not advertised as a pool for dogs but customers report that it works great for their dogs to cool off in. It is made of 100% recycled LDPE flexible plastic which gives it an almost a rubber-like quality. The smooth edges allow your dog to enter and exit the pool easily without any sharp edges to harm it. With an 85-gallon capacity, it is a great pool for large dogs. It is impact resistant so it is super durable and will not get ruined by your dog. The ¾ inch brass drain plug can be released when you need to drain the pool to clean it. When looking for a dog pool for a small dog, you want to make sure to choose one that is size appropriate so that your dog doesn’t get lost in a pool that is too big. If you get a large pool and fill it up with water, your small dog will not even be able to stand up in it. Pools for small dogs are usually around 23-31 inches in circumference and about 8 inches in height. Although you will need a smaller pool for small dog, think about if your dog will have toys in the pool and make sure to buy one that can accommodate both the dog and toys to play with. The size of pool you should get for your dog also depends on what your dog will use it for. If you want to provide a space where your dog can just lie down in some water to cool off, you will not need a very large pool for your small dog. If you want your dog to be able to swim around and play in the pool, you should go for a bigger dog pool. ​Your dog will likely love to rough play in the pool, and you don’t want to have to worry about the pool getting ruined by your dog’s claws. Of course, also make sure to keep your dog’s nails properly trimmed. Inflatable pools can easily be popped by your dog so they are not the best option. Any good dog pool should be made of tough materials, like PVC, so that it can withstand the rough play of your dog. In the summer, dogs shed much more than they do in cooler months, which can quickly dirty the pool. Shed hair and drool from your dog make it necessary to regularly clean your dog pool. To make cleaning easier for you, make sure to buy a pool that is easy to drain. The side walls should be easy to rinse off so that you can quickly clean it. Your dog should be able to easily get in and out of the pool. This can be more difficult for small dogs so you may need to install some steps or a ramp so that they can easily get in and out of the pool. Dog swimming pools can range greatly in price depending on the materials that they are made of. Fortunately, even many cheaper options are still very good quality so you aren’t obligated to spend big bucks to get a good quality pool. If you live in an area where it is warm most the year and your dog will be using the pool very frequently you may want to opt for a more expensive option that is extremely durable. But if you live in a place where there are several cooler months, a cheaper option should work just fine. Before you even start shopping, decide what your budget is and stick to it. If you will need to install steps or a ramp so that your dog can get in and out of the pool, be sure to factor that cost into the budget. Just like you need to monitor children when they are using the pool, you will also need to supervise your dog in the pool. It is not a good idea to leave your dog unsupervised, especially if the water is deep enough for it to swim in. Before making a purchase, think about if you will really have the time to properly supervise your dog when it’s using the pool. This is probably one of your number one concerns if your are looking for a pool for your large dog. You want to make sure the pool will be big enough to accommodate it. To determine how big of a pool you need to buy, consider what your dog will be doing in the pool. Will it mostly be lying in the pool? Or will it want to splash around and play a bit? For dogs that just like to sit or lay in a pool, it needs to just be big enough for them to comfortably do this. 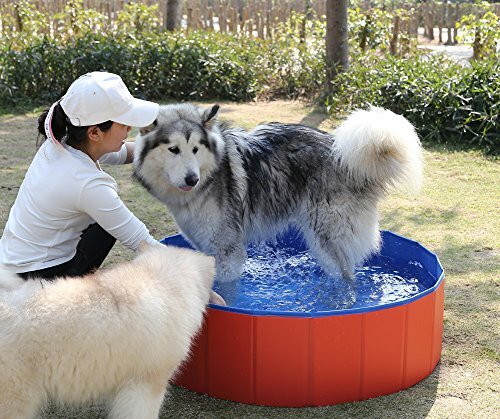 If the dog will be playing in the pool, you will need to purchase a bigger size so that it is big enough for it to move around in it a little bit. Pay attention to the dimensions of the pool to pick the right size for your dog. There are times you may want to take the pool with you, maybe to a friend’s house or on a family trip where you plan to take your dog along. If that is the case, you want to make sure that the pool is easily portable and won’t take up much space in your car. Of course, plastic pools are bulky so they may not be the best option for you if you want an easily portable pool. The best choice is to opt for a foldable option. Many dog pools that are made of PVC can be folded up very compactly, making them easy to take anywhere with you. Dog pools can take quite a bit of abuse-from the scorching sun and your dog jumping in and out of it as well as occasionally chewing on it. Your pool needs to be able to withstand this abuse, so make sure it is made of strong materials like PVC or truckbed liner material. Any UV resistant or chew resistant properties are a huge plus. Does It Have A Drain Plug? A drain plug makes emptying out the pool so much easier. Without a drain plug, you will have to tip over the whole pool to get the water out, which can be difficult. For a pool with a drain plug, you simply release it to let the water drain out so that you can clean the pool, store it away, or take it with you somewhere. Large dog pools are more pricey than the smaller ones, so you will need to have a budget clearly in mind before you shop. You may have to spend a little bit more to get a good quality product, but this doesn’t mean you have to run out and buy the most expensive option either. You want to get the best bang for your buck, so go for a good quality option that will last you some years rather than a cheap, poorly made pool that you will soon have to replace. Hard plastic pools often cost more than other types of pool, such as those made of PVC. So if you go for a hard plastic pool, keep in mind you may have to shell out a few extra bucks. Before starting your search, have your budget clearly in mind. Some people just buy a cheap kiddie pool for their dog to play in, but as we already discussed at the outset, pools made for dogs are much more superior than the typical kiddie pools when it comes to durability. The standard plastic kiddie pools crack easily and cannot withstand the scratches from your dog’s claws. If you buy a cheap kiddie pool, you will find yourself soon having to replace it. So it will be worth your money to spend a few extra bucks to get something good quality that will last a long time. Plastic pools for dogs are often made of truckbed liner material which is super durable. It is a huge plus if the pool material is chew resistant since dogs love chewing on things. The hot summer sun will be beating down on the pool so it is a big advantage if the pool is also UV resistant to prevent the sun’s rays from causing damage. You will have to empty out the pool regularly to clean it and put in new water. A drain plug is a huge plus since it makes emptying out the water much easier. Some pools do not have drain plugs but are shaped in such a way that they are easy to tip over to pour out the water. Make sure to get a pool that is appropriate for the size of your dog. Pay close attention to the dimensions of your pool. Most hard plastic pools are made for large dogs, so if you have a small dog, you may want to opt for a different type of pool. A big pool is not suitable for a small dog since it will not be able to even sit or lay in the pool without its head being submerged in the water if the pool is filled up. The size of the pool you should get also depends on what exactly your dog will be using it for. Will your pup just want to lie in it or play in it? If your dog wants to lie in it to cool off, a smaller pool can be suitable. Just make sure the pool is long enough for your dog to lay comfortably. If your dog will use it to play in, you should go for a bigger pool so it has room to splash around and play with his water toys. If you have a small dog, there are certain pools made to accommodate his size. You want to make sure to get a pool that is not too big, otherwise your dog will not be able to sit or lie down in the pool without his head being submerged in water. Pools made for small dogs have just the right dimensions to accommodate their users. They are usually made of strong PVC material for durability and usually have a drain plug for easy cleaning. Many can be folded up after being drained for easy portability. For large dogs, of course you will need a bigger option. No big dog wants to be crammed in a little pool, so pools made for large dogs will work great for them. They are usually made of truckbed liner material or PVC material for durability. They also have a drain plug so that you can easily drain the water for when you need to clean the pool. Purchasing a pool for your dog is a great way to keep your dog cool in the summer. It will prevent your dog from overheating which can be life-threatening and will be a great play area during the summer months.